Reserving professional aerial application in Texas is simple and convenient. FairLifts, a leading reservation specialist, has crafted a streamlined reservations process that translates your project specifics into workable aerial solutions. With a single phone call, Texas growers and producers will secure helicopter support across a range of applications that sees not only their yield quality improve but also doesn't bust their budget. When the Texas Ag community integrates helicopter support into their crop management routine via FairLifts, a local network of professional vendors and seasoned agricultural pilots facilitates dusting and spraying cost-effectively, accurately and efficiently. 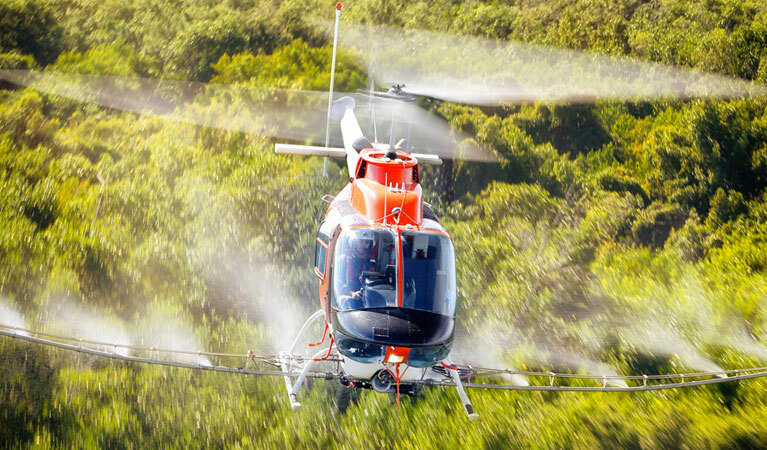 Helicopters are ideally suited in the application of pesticides and herbicides because they allow for a more comprehensive approach with a significantly less harmful impact to surrounding environments. Also, helicopters are increasingly more cost-effective as opposed to terrestrial alternatives which not only take more time but can easily damage crops reducing the value and hardiness of the yield. A helicopter’s inherent maneuverability allows for them to travel into remote areas making them the quintessential resource for Texas growers to conduct crop surveys and to proactively apply frost protections before frigid temperatures start to negatively impact crops. FairLifts works in conjunction with the Texas farming and growing community to provide cost comparable and efficient options that get the job done quickly and accurately. According to a popular phrase repeated most often by native Texans themselves; everything is bigger in Texas. Interestingly, the first ever intimation that Everything is, in fact, bigger in the outsized state was during a conversation between a Texan visiting the state of New York circa 1906, in which a New Yorker implied that nothing in the world was a big as their prized cantaloupes, to which the Texan replied that the fruit seeds in Texas were as big as the cantaloupe in question. And ever since the phrase has reappeared a number of times. It shouldn't surprise that the initial implication that everything is outsized in Texas was in respect to the characteristics of their ag industry. The state of Texas is the leader in the US for the total number of working farms and ranches. More than 240,000 operations contribute large amounts of the state's top commodities including cattle, calves, cotton and dairy products, respectively into the state's economy with the overall ag impact achieving $115 billion dollars each year. These respective farming and ranching operations each span roughly 500 acres on average for a cumulative expanse of over 130 million acres statewide. With this type of significance being placed on quality of products produced, its imperative that the farming and ranching communities in Texas have a reliable resource to make the treatment of their crops an easier and more effective prospect. Helicopter facilitated aerial applications can easily benefit the Texas agricultural industry because not only can they easily cover the acreage associated with the biggest farms and ranches in Texas, but also because they can treat crops more precisely while keeping cost competitive. 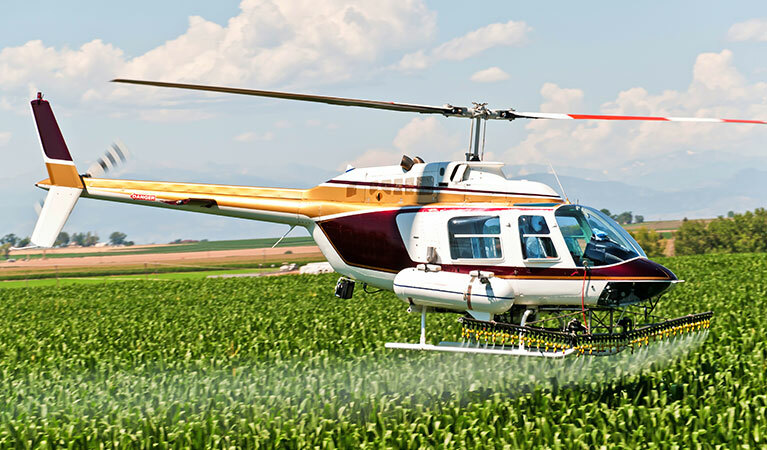 Helicopters piloted by experienced aerial applicators deliver a range of expertly facilitated crop dusting applications including the spreading of dry and liquid fertilizers, fungicides, aerial seeding, watering, and hydroseeding across Texas. Seasoned pilots fly Ag operations in advanced helicopters equipped with cutting-edge technologies intended to enhance and improve the safety during chemical application and make the art of ariel application even more precise. High tech innovations like GPS swath guidance, aerial imagine, and prescription mapping and dispersal systems have simplified the process making it streamlined, time and cost effective and to a greater extent, more defined than ever before. Helicopter application or spraying of pesticides is often conducted to decrease pest populations and confine disease-carrying insects. Previously, chemicals were used that were potentially harmful to humans, pets, and environments. Now, the agricultural community has opted for usage of chemicals that have been proven less harmful to all vertebrates and environments, yet will prevent the spread of bloodborne disease and destruction of crops by reducing pest and insect population growth. Helicopters are used in the safe and effective spraying of chemicals in urban areas, across forestry and over thousands of acres of agricultural croplands in efforts to combat the harmful effects of pests including gypsy moths, blackflies, and mosquitoes while adequately mitigating spray drift and applying treatment to several acres at one time. Aerial application of herbicides in the management of brush and weeds is the most economically feasible option for the crop growing industry. Using helicopters in applying herbicides is not simply more cost-effective but also saves time and mitigates the need for supplementary ground crews. A single helicopter can effectively treat the same size area that had been previously necessitated the employ of 10 to 20 workers, sometimes treating up to 4 acres in less than 10 minutes time. Helicopters can additionally cover inaccessible areas and those possessing rugged terrain, as well as chemically side trim and manage brush acres on ROWs, and control the spread of noxious vegetation. Frost protection is vital in effectively managing outputs for the Texas fruit growing community, especially at times in the growth stage when the buds are especially vulnerable. Frost damage could result in missed opportunities. The correct time to apply seasonal frost and freeze protections largely depends on the variety of fruit planted and its date of flower development and/or date of maturity. Regional weather patterns should additionally be considered. Texas fruit producers can easily ensure they have a reliable resource available to apply a proactive approach to fighting frost damage. Helicopters are used widely in the application of frost protection throughout the world, in orchards and vineyards. Experienced pilots certified for night flights put their expertise to work to deliver adequate nighttime frost protection to specific areas or entire orchards. Seasonal and inclement weather is unpredictable, to say the least, secure adequate frost protections now before it's too late. FairLifts agents are available 24/7 to speak with you about coordinating aerial applications that effectively protect crops and increase the overall quality of the yield. Hear information about the array of services we can organize and get cost competitive price quotes while you’re on the line. Reaching out is easy, simply call anytime. FairLifts works hard to deliver workable solutions to the Texas agricultural community via access to a globalized network of agricultural helicopter operators, experienced pilots, and advanced hardware. Connect with us today to secure expert aerial application services in Texas.